From our theme this time, “Searching for the roots and origins of Himi as well as ourselves”, we started to make prototypes of pottery from the Jomon Period, deeply related to Himi. From the evening of Friday the 18th of November to the 20th, we burned off dead grass to make pottery in Ueda, Himi city! Our staff neatly and carefully put small Xs around the fire, covered them with chaff and continued burning them for 3 days. 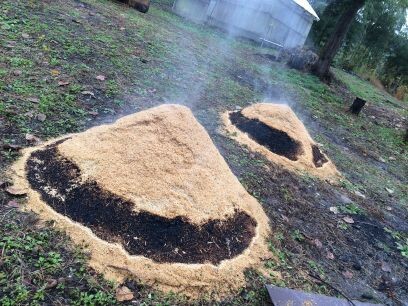 While burning them, the scorched black and smoked chaff on the top seemed to be very hot, however it was not at all. What a surprise! We learned that chaff has excellent temperature control. 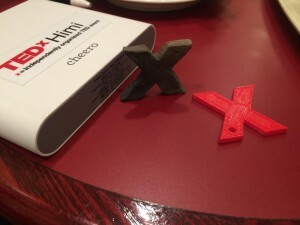 The 6th TEDxHimi meeting was held on the afternoon of 19th as we watched the fire. After the meeting, everyone except the person watching the fire went to Umi-Akari to see and confirm the reception place among other things. The small Xs were baked without even a hint of trouble! What a relief!! These“small Xs”will be souvenirs for you on January 29th, 2017! Look forward to seeing them then!